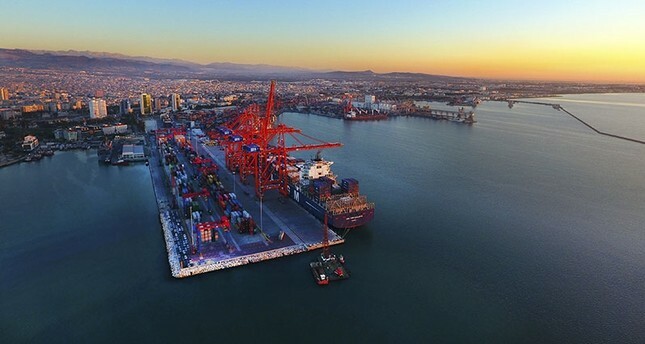 Turkey's foreign trade gap in 2018 narrowed 28.4 percent year-on-year, the country's statistical authority announced on Thursday. The figure reached $55 billion last year, down from a $76.8 billion deficit in 2017, according to the Turkish Statistical Institute (TurkStat). Turkish exports rose 7 percent on a yearly basis to hit $168 billion, as imports dropped to $223 billion, indicating a decrease of 4.6 percent. The exports-to-imports coverage ratio advanced to 75.3 percent last year, up from 67.1 percent in 2017. In 2017, the country's exports were nearly $157 billion, while imports were at $233.8 billion. Turkey's exports to EU, its main trading partner with a share of 50 percent, surged 13.7 percent year-on-year to total at $84 billion last year. Exports to Asian and African countries, the other largest export markets for Turkish products, were $41.8 billion and $14 billion, respectively, in 2018. According to TurkStat, Germany was the top export market for Turkey, with some $16.1 billion worth of exports. It was followed by the U.K. with $11.1 billion, Italy with nearly $9.6 million and Iraq with $8.4 billion in 2018. Most of Turkey's imports last year were from Russia with almost $23 billion. Followed by China with $20.7 billion, Germany with $20.4 billion and the U.S. with $12.4 billion. The data showed that manufacturing accounted for the lion's share of total exports, at 93.9 percent or $157.8 billion. Agriculture and forestry exports (nearly $5.6 billion) got a 3.3 percent share, while mining and quarrying exports had a share of 2 percent at $3.4 billion. The share of high technology products in the manufacturing industry exports was 3.5 percent while the exports shares of medium-high and low technology products were 36.4 and 27.6 percent, respectively. According to the provisional data in December, exports were $13.88 billion with a 0.2 percent increase and imports were $16.55 billion with a 28.3 percent decrease compared with the same month the previous year. The foreign trade deficit also fell by 71.1 percent to $2.67 billion on a monthly scale. The export-import coverage rate was 83.8 percent, rising from 60 percent in December 2017. Seasonally and calendar adjusted exports decreased by 5.5 percent while imports increased by 1.7 percent compared with the previous month. Calendar-adjusted exports increased by 0.3 percent while imports decreased by 28.2 percent compared with December 2017. Exports to the EU-28 increased by 0.4 percent to $6.55 billion. The proportion of the EU countries in exports was 47.2 percent in December 2018 while it was 47.1 percent in December 2017. The main partner country for exports was Germany with $1.2 billion, followed by the U.K. with $893 million, Italy with $741 million and Iraq with $712 million. The top country for Turkey's imports was Russia with $1.78 billion, followed by Germany with $1.72 billion, China with $1.29 billion and the U.S. with $997 million.